Topgolf Gift Cards open the doors to an unforgettable time with your friends and family. From the bay to the menu, to upping your game and wardrobe, there are a variety ways to get the most out of a Topgolf Gift Card. Redeemable on Topgolf game play, food and drinks, Lifetime Memberships, lessons and gear. 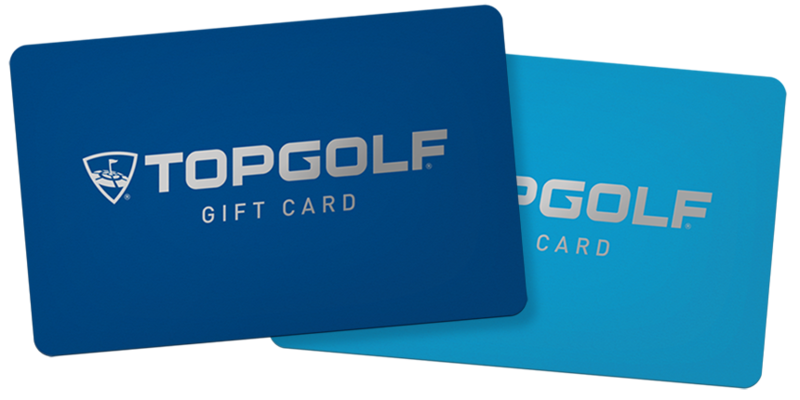 Gift cards can be redeemed at any Topgolf location in the U.S., and online for select venues. Send instantly via email or send a traditional gift card via mail. There's no better way to show some love to your customers and employees than with a Topgolf Gift Card. Bulk up with our available volume discounts, and get them fast with expedited shipping, or even faster with eGift Cards. Redeem these bad boys at any U.S. Topgolf location and online at participating sites. LEARN MORE Opens an external site in a new window that may not meet accessibility guidelines. Currently, Gift Cards cannot be used toward online reservation fees or any event/program such as NYE or seasonal academies. Card is issued by and represents an obligation of Topgolf Pro, LLC. Purchase or use of card constitutes acceptance of the following terms. Card cannot be redeemed until activated. Purchases made with the card will be deducted from the balance until it reaches $0.00. Card is redeemable at any Topgolf location in the United States and online at participating Topgolf sites. It cannot be redeemed for cash except where required by law. Treat card as cash, as it will not be replaced if lost or stolen, except where required by law. Card has no expiration date and incurs no dormancy fees. Topgolf reserves the right to amend these terms from time to time, as provided at topgolf.com. Cannot be used toward payment for parties and events. Sales tax will not be added when purchasing a Gift Card. Purchases made with a Gift Card will be taxed including game play credit, food & beverage, retail, lessons and merchandise. Not redeemable on gratuities, private parties or events, food, alcoholic or non-alcoholic beverages, or other merchandise. Not redeemable for cash or refund, including on any unused portion. May be used in conjunction with a Topgolf Gift Card, but cannot be used in combination with any other promotion, offer or discount. May be used only once and applied to only one (1) Membership; any unused value will be forfeited. Only one (1) may be used per group/bay.